Malaysian police carried out another raid of cartoonist Zunar’s office in Kuala Lumpur yesterday, seizing about 150 books despite having obtained no warrant for the search. Zunar himself is currently abroad in London, but has once again been summoned to a police station for questioning on sedition charges upon his return to Malaysia. The raid began yesterday morning when two police officers arrived at the office that Zunar and his assistants share with the newspaper Suara Keadilan, which is run by a political party opposed to the ruling party Barisan Nasional. Staff who were present refused to speak with police due to the lack of a warrant, but four more officers soon arrived and carted off Malay and English-language copies of Zunar’s books Conspiracy to Imprison Anwar and Pirates of the Carry-BN. The police also demanded to know who owns the building where the office is housed, continuing a pattern of pressuring everyone with even a marginal connection to the cartoonist. In recent months authorities have harassed printers, retailers, Zunar’s webmaster, and the payment processor that facilitates the sale of books through the website. 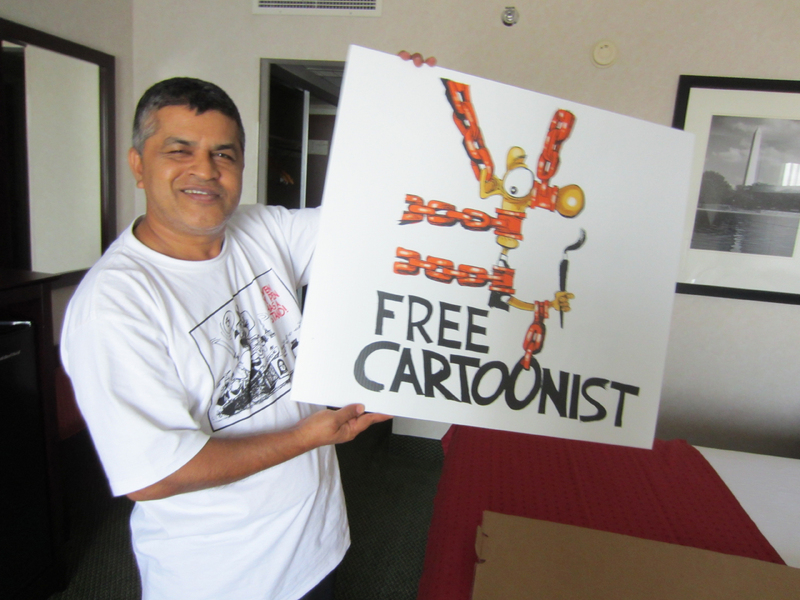 It’s shocking and outrageous that the Malaysian government crackdown on freedom of expression has now resulted in an office raid of the prominent cartoonist Zunar and seizure of his books. There is absolutely no justification for this act of censorship by police raid, and Zunar’s books should be returned to him and any consideration of charges against him immediately dropped. Malaysia’s sedition act inspired onslaught raises fundamental questions about whether the government is seeking to cement its power through police action to silence those who voice disagreements with the powers that be. All those inside and outside of Malaysia who care about respect for human rights and democracy in Malaysia need to stand up now and demand the government stop these wrecking ball tactics on activists and members of the political opposition. Human Rights Watch proudly gave a Hellman Hammett award for defenders of free expression to Zunar in 2011, and we will continue to stand by him as he fights for his rights.